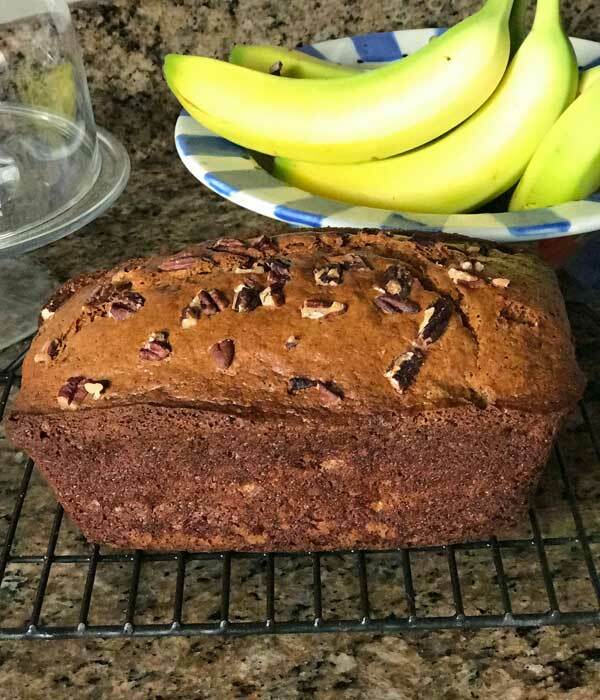 My daughter and I are having a hard time deciding which banana bread recipe we like better — Famous Banana Bread from Flour Bakery, or this banana bread with sour cream and oil. 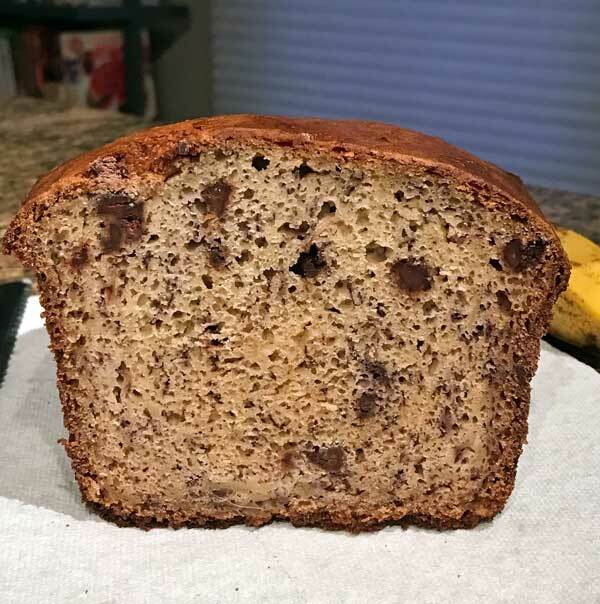 I’ve had the recipe for years but kind of forgot about it until recently when I was going through all my sour cream banana breads. This one tends to rise a little higher and is less sweet. The sour cream and oil work together to keep it moist, and it develops a handsome brown crust as it bakes. In addition, it stays fresh at room temperature for days. This banana bread takes a long time to bake. It will be nice and brown after an hour, but the inside may still be slightly wet, so plan on it 75 minutes. Of course the bake time could vary depending on your oven and loaf pan. I like baking this one in a Pyrex loaf pan. 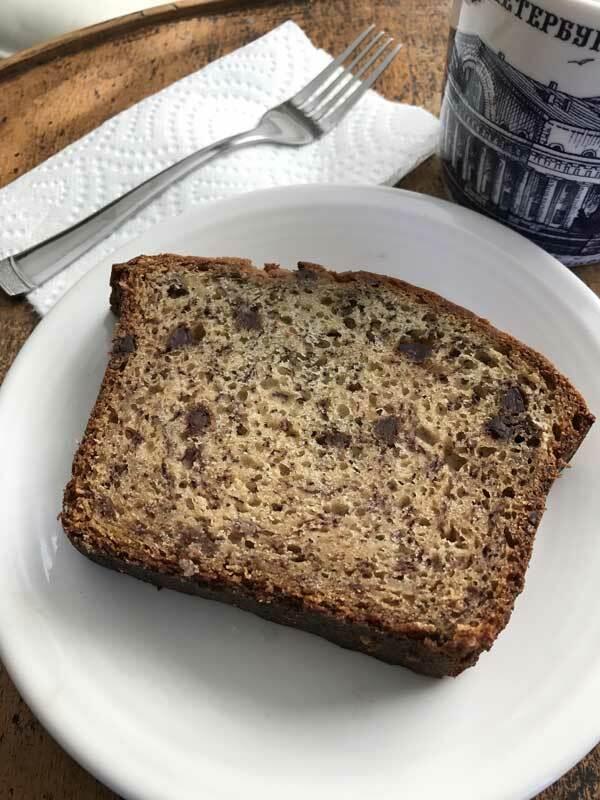 This is a golden brown slightly lighter textured less-sweet banana bread made with vegetable oil and sour cream. It rises fairly high and has a nice shape to it. Make sure to thoroughly mix the dry ingredients before adding them to the batter because the batter doesn't get stirred very much and unevenly mixed leavening agents may leave streaks. Preheat the oven 350°F Grease and flour a 9x5 inch loaf pan. I always use Pyrex for this one. In a large bowl, thoroughly whisk together the flour, baking powder, baking soda and salt. Combine the sugar, eggs, oil, and vanilla in a mixing bowl and mix just until blended. Add the bananas and sour cream and mix until just blended. Scrape down the sides of the bowl, add the flour mixture, and mix until just blended. Transfer batter to loaf pan and bake for about 75 minutes (test it after 60) or until a toothpick inserted in the center comes out clean. Let cool on a rack for 10 minutes.Loosen edges with a knife and let cool for another 30 minutes, then invert from pan and let cool completely. I use a Pyrex loaf pan for this and the bake time is almost always 75 minutes. Time may vary depending on type of loaf pan. I also like to line the loaf pan with a strip of parchment.